**If the number of candidates registered for Computer Based Test is limited and can be accommodated in a single day; the test will be completed on 08 September 2012 itself. In different Time slots at specific test venues; subject to number of candidates registering for Computer Based Test. Obtain crossed Demand Draft (DD) of Rs 1200/- (One thousand two hundred only) in favour of ‘All India Management Association’ payable at Delhi from any Bank. Register online at websitealongwith the DD details. Detailed procedure is given on the www.aima-ind.org/matsep12/ website link. 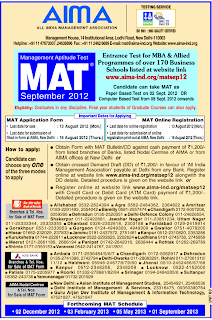 Register online at website link www.aima-ind.org/matsep12/ with Credit Card payment. Detailed procedure is given on the website link. The Paper-Based Test will take place only on one day i.e., 02 Sept 2012 at one time slot i.e., 10.00am-12.30pm, whereas the Computer Based Test will take place from 08 Sept 2012 onwards in different time slots. 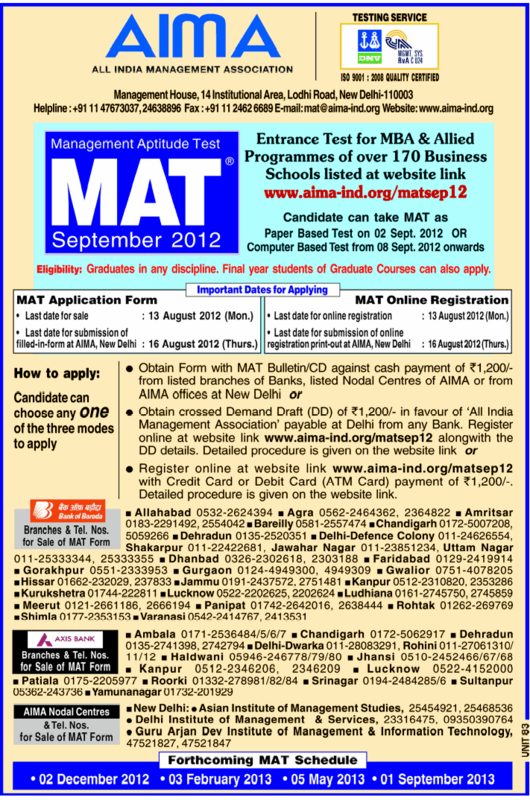 If the number of candidates registered for Computer Based Test is limited and can be accommodated in a single day; the test will be completed on 08 Sept 2012 itself. If the number of candidates registered for Computer Based Test is few in a particular centre, these candidates have to appear for the Paper-Based Test on 02 Sept 2012 only. Further, your form will be scrutinized and if found in order; it will be provisionally registered. Candidates applied for Computer Based Test and who have been permitted to appear for the Computer Based Test; have to down load the Admit Card 7 days before the Paper Based Test date i.e., with effect from 25 August 2012 (Saturday) from AIMA website. Candidates accessing the website the earliest can choose the Date and Time of his/her choice subject to availability. Those who have not opted the date and time slot for 4-5 days; will be automatically allotted date and time slot by the system. No request for change of date and time slot can be entertained. your blog is excalent. It is very useful for me so keep it up. IBPS / GATE/ TET/ CTET/ LAW/ LLB at Edu Gaps Chandigarh.